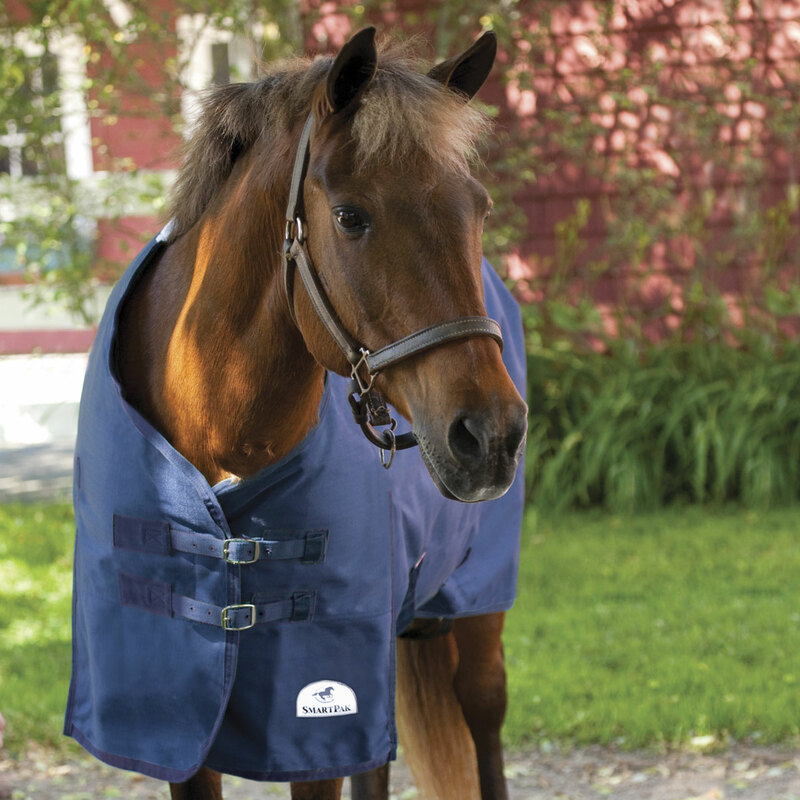 Protect your pony from the elements at an unbeatable value with the SmartPak Classic Pony Turnout Sheet. 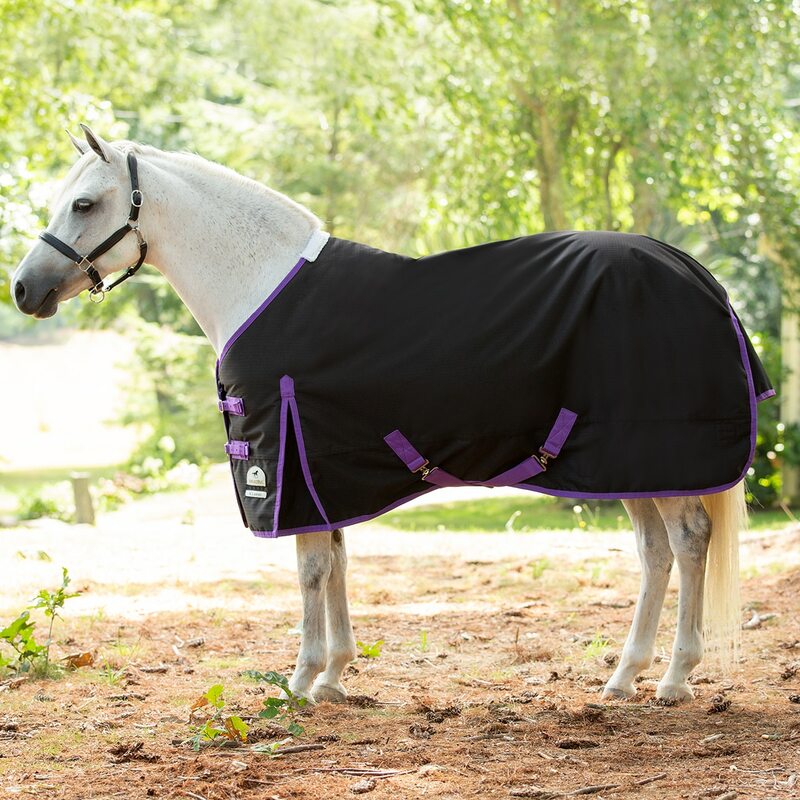 The 600D ripstop nylon outer is waterproof but breathable so your pony stays warm and dry during inclement weather. 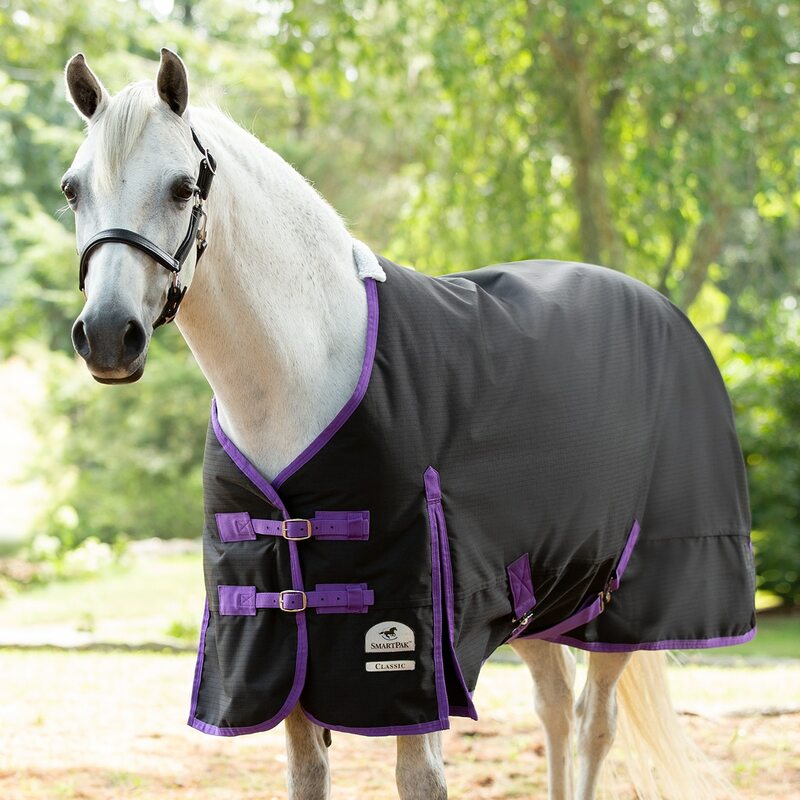 Plus, it also has a silky nylon lining and fleece padding at the withers to help prevent rubs. Additionally, roomy shoulder gussets give your pony the freedom of movement he needs and a tail flap provides some extra protection from wind, rain, or snow. Finally, two front buckles, cross-belly surcingles, and elastic leg straps provide an adjustable fit and keep the sheet securely in place. Available in Light (0 g). Please note: We recommend placing embroidery on a surcingle. Embroidery on the body of the blanket may interfere with the blanket's waterproofing. SmartPak Classic Pony Turnout Sheet is rated 4.6 out of 5 by 38. Rated 5 out of 5 by Patty from Great Blanket This Turnout Blanket is wonderful even for a furry pony like Papi and the perfect size. Rated 5 out of 5 by Smoothsailing91 from Well fit for ponies!! It isn't very tough to find a blanket that is cut correctly for ponies, this one fits wonderfully! Thank you Smartpak!!! Rated 4 out of 5 by Jaye from Love this blanket EXCEPT... Really love the quality of this blanket (and the color!) and all SP blankets in general; however, I find that the pony size blankets have HUGE neck neck openings that need to be able to adjust smaller. This blanket, because it has a lot of fill (360 gm) will thankfully work without alterations; rear leg strap d-rings also too low--need to come up 3-4". Rated 4 out of 5 by Lilhorsegal from Durable fits a little big I bought this for a thin rescue pony. He hopefully grows into it as he gains weight. I love smartpak and will buy again. Rated 5 out of 5 by Risas Mom from Good Blanket! This medium weight blanket is well made, fits right, & stays in place. Bought for my 14-hand Arab and it keeps her warm down to the low 20s-upper teens. I'll switch to her heavier blanket when temps reach teens to minus zero numbers consistently. I'd recommend. Rated 4 out of 5 by Brooklyn70 from Good price, working well... I am a first-time pony owner getting through our first winter... I got this because it was a good price and I trust SmartPak (and no-hassle returns if something doesn’t fit!) So far, so good...and my boy looks handsome out in his paddock!